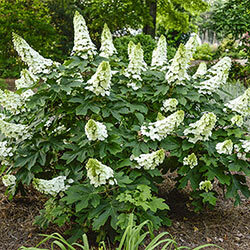 You will love watching this oakleaf hydrangea change again and again. The blooms start white, and mature to pink and then red through the summer season. Then the oakleaf shaped foliage, which is a lovely green through the bloom season, turns brilliant wine-red in fall. 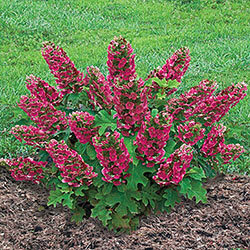 The shrub is compact and manageable, growing up to 4' tall and 5' wide. 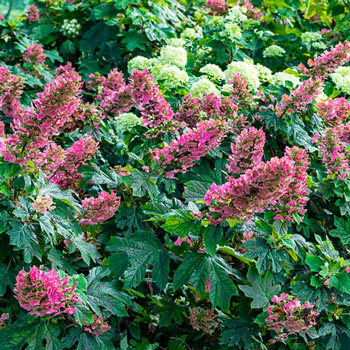 There is no loss of impact, the vibrant blooms grow on 9" panicles. Towards the end of the season, grab some to dry by hanging upside down and you'll have a lovely dried bouquet for the home. The leaves are sturdy, standing up well to sun, wind and rain. Soil Requirements: Well-drained, moisture-retentive soils, enriched with organic matter. Also does well in dry soils.